RoboBusiness Europe, the continent’s premier business development event for robotics will come to RoboValley next year, 20 and 21 April 2017. During the closing ceremony at the Odense Congress Center today at this year’s edition, CEO Marianne Andersen and Jane Jegind of Odense municipality officially handed over the flame to Arthur de Crook, programme manager at RoboValley. 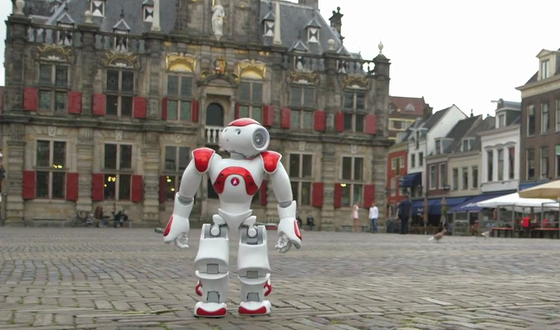 "Delft is the epicentre of RoboValley, with Delft University of Technology and TU Delft Robotics Institute as its beating heart"
RoboValley has ambitious plans for next year’s conference. Apart from top level speakers, we will transform Delft into a true ‘RoboCity’. Visitors will experience robotics from the moment they arrive in the city. For example, WEpods will be standing ready at the train station and drones will be flying in the city centre. The theme of next year’s conference is ‘Robotics for Life’. It is a reference to Delft University of Technology’s 175th anniversary in 2017, which will be celebrated under the motto ‘Technology for Life’. With ‘Robotics for Life’, RoboValley will focus on the major benefits robotics can have for human life.